As IT organizations look for better ways to build clouds and virtualized data centers, they are turning to high-performance networking solutions that increase flexibility through leading-edge technologies. 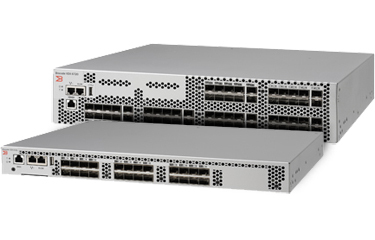 Brocade VDX 6720 Data Center Switches are specifically designed to improve network utilization, maximize application availability, increase scalability, and dramatically simplify network architecture in virtualized data centers. By leveraging Brocade VCS technology, the Brocade VDX 6720 builds data center Ethernet fabrics—revolutionizing the design of Layer 2 networks and providing an intelligent foundation for cloud computing. Whether organizations want to enhance their classic hierarchical network architectures, deploy flatter scale-out fabrics for virtualized data centers, or converge networks, the Brocade VDX 6720 delivers the innovative technology to enhance and simplify their networks. As the world’s largest reseller of refurbished Brocade hardware, we offer an extended 5-Year warranty to end-users for every piece of gear we deliver. This warranty includes advance replacement, which means when you call us to report a problem, our technical team will work with you quickly to assess the problem. If we cannot overcome it, we ship a replacement unit immediately. Your sales rep will then provide an email to you with RMA instructions for returning the faulty unit. *In the event we cannot supply a replacement unit, we will provide a refund or credit once faulty unit is returned. The defective product must be received by Townsend Networks within 30 calendar days from the date the RMA is issued. A defective product received by Townsend Networks more than 30 calendar days from the date the RMA is issued will not be accepted by Townsend Networks and will not be eligible for repair, replacement or credit. Hours: Monday to Friday, 9am – 5pm, Pacific Standard.